Identify the aesthetic, green building, and performance significance of floor surfaces as part of the overall interior design of a building. Assess the health and safety performance aspects of floor surfaces as they relate to indoor environmental quality, durability, and sustainability. Flooring is one of the most used and most noticeable features of any building interior. Its aesthetic impact is related to both its initial material makeup and the ability of that material to hold up over time with continual use. The presence of not only people walking in all types and manner of shoes but also the things they carry in on those shoes, such as dirt, snow, water, and other contaminants, can wear down the finish of the floor. The use of heavy-duty cleaners and polishes to overcome that issue is the usual response, but some of those can be equally as harsh and damaging to flooring. Further, many floors in commercial buildings need to withstand rolling carts, suitcases, or even small motorized vehicles, all of which add their own stress on the floor system. Beyond all of this, the ubiquitous nature of flooring means that the materials used either in the flooring product itself or the materials needed to install it, such as adhesives or cements, can have a significant impact on the indoor environmental quality of buildings. Hence, it is often the focus of green building design attention. 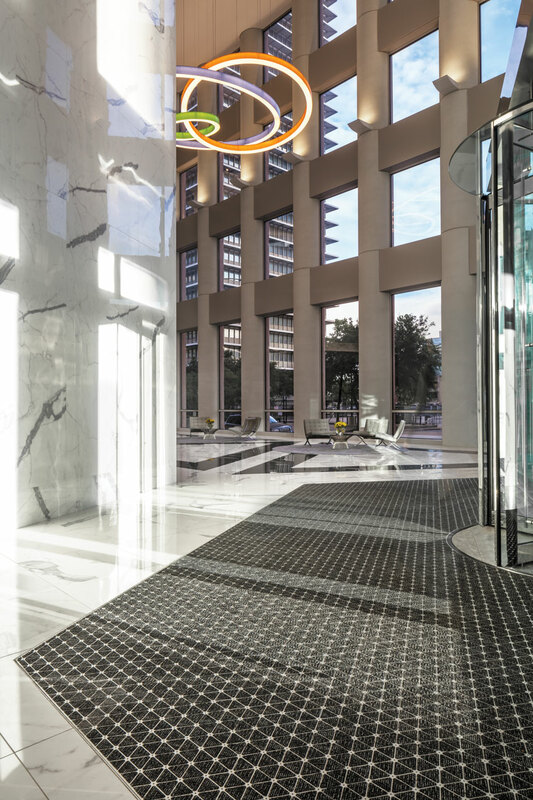 Flooring systems can be used to provide innovative designs that address aesthetics, performance, and green building principles as shown here at Wedge Tower in Houston. In response to the need to not only look good in a variety of colors, styles, and patterns but also to hold up to the usage and environmental demands of commercial buildings, flooring product manufacturers have worked hard to develop and improve their offerings to design professionals. In this course, we will look first at some considerations for the structure that a flooring system rests on and then some of the innovations and options currently available. By understanding flooring choices as well as the characteristics and properties related to those choices, architects and others can design and specify flooring systems that hold up and perform well, contribute to better indoor environments for people, and look great. Before delving into particular finish flooring choices, it is important to consider that the structural system of a commercial floor is a critical component of any flooring. As the structural substrate to the flooring, its attributes interact with the flooring in ways that either create favorable conditions for the finish flooring to function or, alternatively, can cause problems. In fact, most finish flooring problems come about not because of problems with the finish material but because of problems with the material or structure underneath it. As such, the attributes of the structural floor system can directly affect the real or perceived attributes of the finish flooring, regardless of what is selected. Structural floor systems commonly involve steel and concrete, although there are plenty of variations in how they are designed. Traditional, lightweight systems use steel girders, beams, or trusses to support a metal floor deck that is topped with concrete. That can create some deep systems that require a tall floor-to-floor height. Precast concrete or poured-in-place concrete structural floors can be thinner, but those systems need to be assessed for the amount of additional dead weight they create compared to other attributes that may or may not offset the cost of the added weight. With an understanding of the benefits and drawbacks of different traditional systems, it is not surprising that an innovative alternative is becoming popular in the form of long-span composite floor systems that combine the versatility and ease of erection of steel with the strength and durability of concrete. Referred to as a long-span composite floor system, it achieves a thin-slab advantage characterized by a narrow floor structure, longer unobstructed floor spans, and a range of under-floor aesthetic ceiling options. So while these systems address the economy of the structure, they also address the economy of room spaces with an eye on ceiling design, including the efficient integration of acoustical treatments, controlled sound attenuation, and fire resistance. Dovetail composite deck profiles: This typical profile is capable of supporting clear spans up to 28 feet. Its name comes from the dovetail-shaped profile of the corrugated metal panel that receives the concrete and bonds firmly with it. This can provide extra rigidity and strength that allows finish flooring to function properly without fear of deflection or movement. This profile can be particularly useful in midrise or multistory residential projects, such as hotels, health-care communities, and dormitories where walls between units can support the floor deck without the need for intermediate supports. Deep deck composite profiles: Deep deck composite floors support even longer, wider, and more open spaces than dovetail profiles. Clear spans up to 36 feet are commonly achievable, meaning they are well suited for buildings where open space and free-flowing interiors are sought. Since the nature of the composite metal deck profiles can vary notably between suppliers, and so can the structural capabilities, it is advisable to work early on with the technical support staff of the manufacturers. Some of them engineer and offer a complete range of steel building systems, both traditional and new, so they can provide information for architects and engineers to select the best system appropriate to a particular project. That can help a building not only excel in the area of design intent but also holistically take into account related factors, such as material costs, erection costs, performance capabilities, and project timelines. For example, long-span composite floor systems can be engineered to address unique loads that may be imposed by a particular use, such as equipment placed in the building or curtain wall systems that impose loading on the floor edge. Those conditions may cause unwanted vibrations or deflections in the floor. Working collaboratively, the design team and the manufacturing team can determine the best floor system to address those issues with the proper rigidity and load transfer design. That design also helps to assure that whatever finish flooring is placed on top of the concrete, it will not be subject to undue movement, which can cause degradation and failure of the flooring. 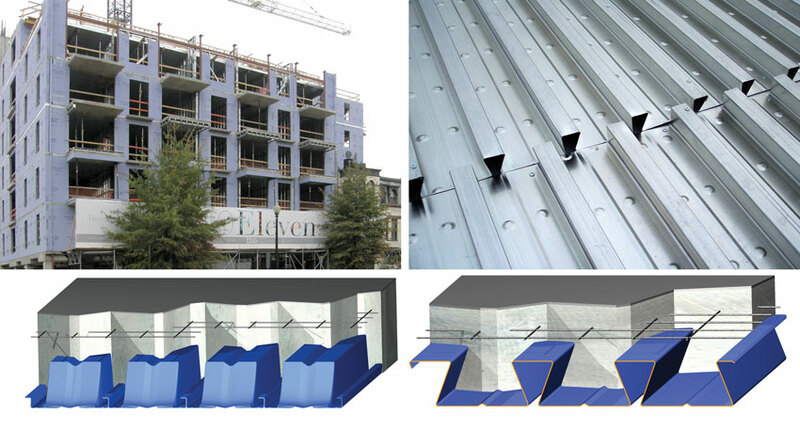 Dovetail composite deck profiles (top right and bottom right) are well suited to residential buildings with clear open spans between dividing walls. Deep deck composite profiles (bottom left) allow even longer clear spans for buildings of all types. Floorometry is a permanent entrance flooring system comprised of stainless steel modular tiles. This product is installed at the main entrance or vestibule of a building and helps to trap incoming dirt and debris. Floorometry is available in four distinct models and can be easily integrated into any design. Forbo’s innovative Marmoleum Slate collection features the look of natural slate with the durability and performance of Marmoleum. Available in six organic designs, slate features inherent antimicrobial and antistatic properties that improve indoor air quality and resist bacteria growth without chemical additives. Slate’s sustainable finish provides exceptional performance against real-world flooring damage. TRI-LITE™ is a lightweight, high-performance, tri-purpose mortar designed for large and heavy tile, thin-bed, and wall installations. A 30-pound bag provides the same coverage as a 50-pound bag of traditional mortar. TRI-LITE exceeds ANSI A118.15, A118.11, and the ISO 13007 C2TES1P1 classification, features excellent large and heavy tile (medium bed) performance, and can be built up to 3/4-inch thick without shrinkage. Versa-Dek®. is a long-span composite floor system that provides steel/ concrete composite action to achieve thin-slab, open floor spans up to 28 feet. In addition to a clear span, the system addresses aesthetic, acoustic, and fire rating demands, while minimizing the total project cost and the owner’s building life-cycle cost.